If you've been studying these individuals, does that make you a trainspotterspotter? I loved the 'deltics as a child and the class 33' & 40's for there dirty loud engines. Them Deltics n class 40's (the whistlers) shake the earth on rev. There's a bloke in Leicester I haven't got yet. 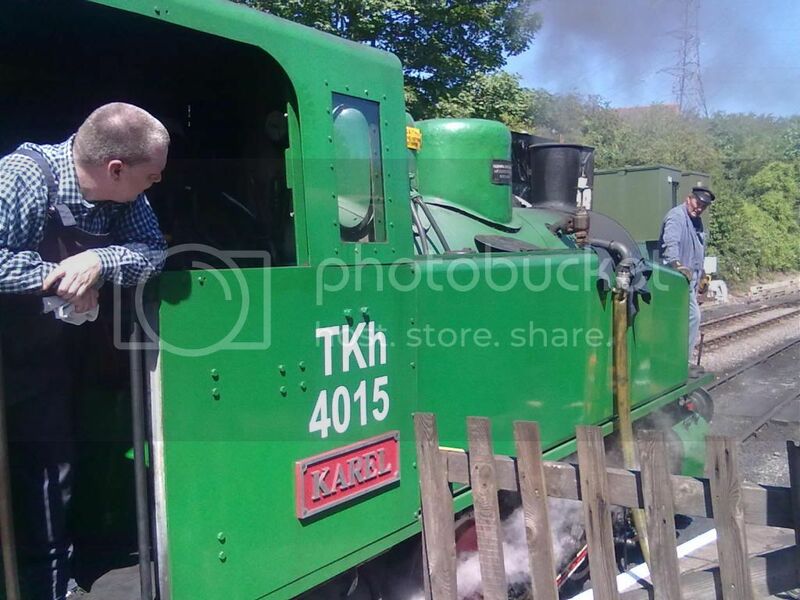 Steam was before my time, so doesn't directly connect with me (though I enjoy seeing steam engines in museums etc), but I grew up near railway sidings and a station. The size, noise and power of a diesel engine was wondrous to me as a little boy, and the whole infrastructure of the rails and 'furniture' is such a different world from the roads that it's fascinating. There's loads of soul in it. The only part I don't get is how adults can remain so fascinated that they collect numbers. But then they may not get how an adult can be fascinated wth reading and writing about bicycle parts. It's some combination of OCD and Aspergers to which some men (it's almost always men) are prone. Egg collectors are a nastier variant. You think trainspotters are weird. There are also lorry spotters, and not just any lorry spotters, but specifically Eddie Stobart lorry spotters. There is a program on telly purely about Eddie Stobart's haulage company, and on one they had a whole fleet of brand new lorries delivered, and before they were sent out on the road, a select group of nerds who had presumably all been invited or applied to be there, were let in to just walk around and look at them. Before they could go out on the road and start making deliveries, they had to wait for them all to go round the whole warehouse and write down the number of each one. Anyway, you can often see these sad twats people sat by the side of roads, on bridges and hanging around service stations taking pictures of trucks. Now i like trucks, i can go to a truck show and look at trucks, if i see a nice truck then i will take a picture maybe, but i dont get why you would want to sit on a bridge taking pictures and writing down notes on plates, names and fleet number. "i think we will produce an excel spreadsheet and cross reference out notes"
One of them wanted their campervan/van being done like a stobby truck. That was the transexual and that other weird chap. Its OCD, they will get a few then MUST GET MORE!!!! There's probably a similar thread on a trainspotting forum enquiring as to WTF people ride bikes. I used to be a trainspotter on the platform of Staines station waiting for my ever-late train to arrive. When it finally did arrive, I went back to scantilly-clad middle-age woman spotting! No, honestly, they have! It's called "Interesting and Unusual Bikes You've Seen". 63 pages I tell you! I'm forced to concede that, to a first-order approximation, trainspotters are just like us, only with more threads about trains, fewer threads about bikes and (presumably - I haven't checked) weak lemon drink instead of CAKE. Actually, General Discussion - RailUK Forums is like a parallel universe version of The Pub. It's even got some of the same threads. I would expect trainspotters to take an interest in CAKE too - but simply not to have access to such a wide variety. It's some combination of OCD and Aspergers to which some men (it's almost always men) are prone. A former girlfriend of mine had a sister who was a trainspotter. She was young, pretty, shapely & blonde. She good draw rather well, & liked drawing train-related things. Most of her drawings were bought by trainspotters. Is that at Colne Valley? 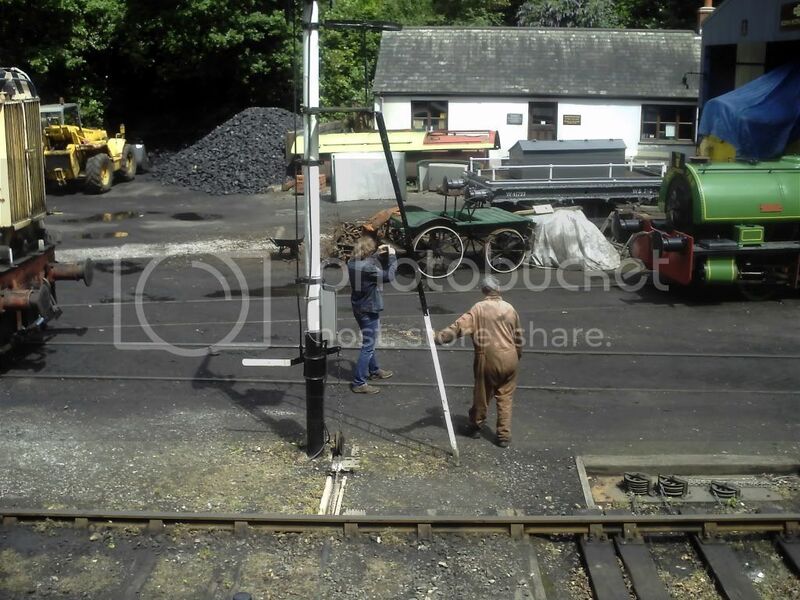 No, the Avon Valley Railway, Bitton. 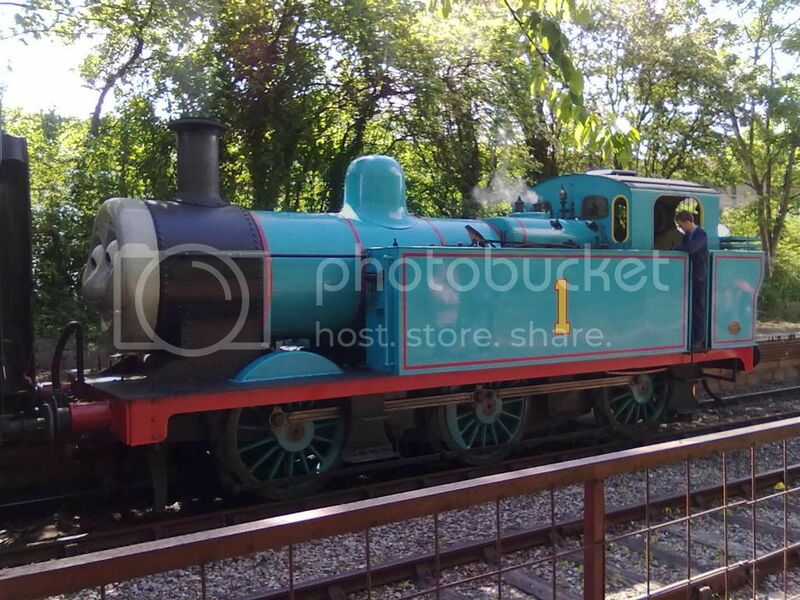 The photo was taken at Oldland Common during their 'Thomas the Tank Engine weekend'. He brought his own headboard, so that he could put it on the train, and then take a photo of it. And yet... My old friend on the railway also told of the time they arranged for a steam service to run with a wreath on the front, in memory of a long time volunteer who'd died the day before the run - might have been a restored loco's first trip I think. There were outraged letters to the railway preservation press about the abomination of the wreath, wrecking people's photos.